God is great and so is the work in Tanzania. This is the week for Future Preacher’s Training Camp. We have a total of 53 boys here ranging in age from 13-25 (they are still considered youth up to this age) all learning how to put together sermons and how to present them. This camp is run just like the camps in America are except that they don’t speak their sermon on Sunday. The boys come from all over East Africa to spend a week in God’s word. It is a great sight to behold when these boys all form groups and talk over their lessons or help each other understand biblical concepts. I thank God that I am privileged to be a part of this great week. 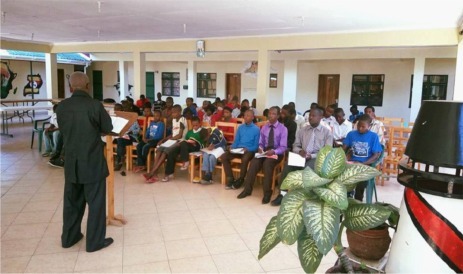 As busy as this week is, we are also preparing for the Tanzania Christian Camp that will begin next Monday. Back to back camps, this camp is for boys and girls so we are all teaching classes this week. We are busy with lesson preparations along with FPTC. Last year we had 150 children attend TCC so I expect much the same this year. It is always a fun week. Praise God. Susan had a good Preacher’s Wives meeting on Saturday. She was missing Haley and had to go alone, but it is always a blessing to see sisters in Christ and share in fellowship and feast on God’s word. She began a study on the book of Proverbs. I think she even gave them homework. This is a blessing to all who attend and Susan has said that the local women who give lessons are doing a great job. She always comes home uplifted and blessed because of the time she spends with them. Praise God for their growth and maturity. We love you all so much and hope that you stay unstressed during this holiday season. Miss you all and we look forward to seeing you this coming summer. Cy is doing well as he awaits his 100 day mark. Please pray for Haley and Mason as they are in the States and travelling a lot. Pray they have a successful furlough. Copyright © 2016 Rio Rancho church of Christ | Site designed by New Heights Marketing, Inc.